Regular defragmentation keeps the system performance consistent. But you cannot sit at your PC through this entire process. What is also irritating is that defragmentation needs to be manually activated if there are several hard disks. Save the ﬁ le as ‘defrag.cmd’. If you are using other drive names or more drives, change the ﬁle accordingly. 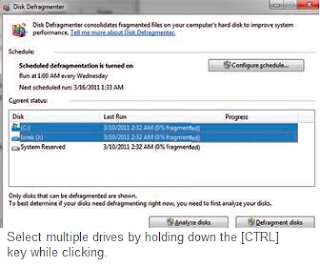 Double click this ﬁ le to defragment all hard disk partitions one after the other automatically without a break. However you need to be logged in with administrator rights for running the ﬁle. The used parameter ‘-f’ carries out the defragmentation even if the hard disk hasless than 10 percent free space, without pausing for an error message. But the process takes too long in that case. What you can do is delete the large ﬁ les that are no longer required. Vista and Windows 7 regulate defragmentation automatically on the basis of a schedule. Irrespective of that, you can either use the batch processing operation via ‘defrag.exe’ or even select several drives simultaneously with the graphical interface. the context command ‘Properties’, activate the tab ‘Tools’ and then click the ‘Defragment now’ button. Under Vista, click the ‘Select Volumes’ button and you can then activate several drives for defragmentation or select ‘Select all data carriers’. Under Win7, keep the [Ctrl] key pressed and then select the desired drives by clicking the entries one after the other.